Specific route details for the 2008 Amgen Tour of California professional cycling race were revealed today by AEG, presenter of the third-annual event. A Tour de France-style cycling road race, the 2008 Amgen Tour of California will challenge the world's top professional cycling teams to compete along a demanding 650-mile course from Palo Alto-Stanford University to Pasadena, February 17-24, 2008. The 2007 race drew more than 1.6 million spectators, surpassing the inaugural year's turnout and setting records in attendance for a single sporting event in California, as well as for any cycling event ever held in the United States. One of the most anticipated professional cycling races in the United States, the 2008 Amgen Tour of California will be staged over an even more challenging route. Featuring elite professional teams and athletes from around the world, the 2008 Amgen Tour of California will bring the drama and excitement of a professional cycling stage race to the California coast for a third consecutive year while showcasing more than 650 miles of scenic California highways, roadways and coastline drives. Scheduled over eight consecutive days from February 17-24, 2008, the race will visit 12 host cities for official stage starts and finishes, with communities along the route getting the chance to see, firsthand, a lineup of some of the best and most recognizable teams and cyclists in the world. 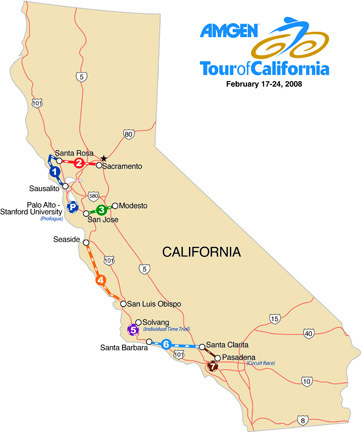 Host cities for the Prologue and seven stages include: Palo Alto-Stanford University (new in 2008), Sausalito, Santa Rosa, Sacramento, Modesto (new in 2008), San Jose, Seaside, San Luis Obispo, Solvang, Santa Barbara, Santa Clarita and Pasadena (new in 2008). "The challenging geographical features and picturesque landscape of California provide the perfect combination of elements for a world-class cycling event," said Kristin Bachochin, senior director of AEG Sports, presenter of the race. "For the third year of the Amgen Tour of California, we remain committed to upgrading and enhancing every element of the race experience for the cyclists and spectators by creating an even more challenging and exciting race." At 1 p.m., riders will kick off the 2008 Amgen Tour of California with a short, but intense, individual time trial of just more than two miles. The flat and fast route will likely take each individual cyclist less than five minutes to finish. Although it is short, the Prologue, sponsored by CSC, will be packed with excitement and high speed. The Stanford Oval will give spectators the chance to see the riders complete a full 360-degree loop before they head to the finish line at the intersection of Palm Dr. and Museum Way on the Stanford University campus. (Start time: 11 a.m.) Starting on the northern side of the San Francisco Bay, Stage 1 will cover nearly 100 miles from Sausalito to Santa Rosa. The stage, sponsored by Herbalife, begins with a climb from Mill Valley up to Mt. Tamalpais State Park before turning toward Muir Beach. The relatively flat route will take the riders north toward Bodega Bay and Coleman Valley Road, a landmark climb in Northern California. Spectators can watch the stage win unfold as the field heads downhill from Occidental for three finishing circuit laps in downtown Santa Rosa. In previous years, the Santa Rosa fans have set the mark for one of the largest and most enthusiastic crowds of the entire race. (Start time: 10 a.m.) A scenic start through several Sonoma County wineries will quickly turn into one of the most significant climbs of the race as Stage 2, sponsored by Union Bank of California, takes the peloton east en route to the state's capital, Sacramento. Twelve miles from the start, Trinity Road's vertical climbs and treacherous decent into the wineries of Napa Valley will make it one of the most difficult climbs of the entire race, as proven during the 2007 Amgen Tour of California. Continuing east past Lake Berryessa, the peloton will head through the cities of Winters and Davis, which recently was named the best cycling town in the United States by Bicycle Magazine. With a quick turn to the north, the route will follow the Sacramento River to the Tower Bridge and on to Capitol Mall in Sacramento. The stage concludes with three circuit laps through downtown, finishing on the front steps of California's Capitol building, a perfect viewing location for race spectators. (Start time: 10 a.m.) A new course for the 2008 Amgen Tour of California, Stage 3 will begin with a neutral start of parade laps through Modesto's revitalized downtown area before heading south through California's scenic farmlands. After passing through Patterson, the cyclists will encounter a defining portion of the 2008 Amgen Tour of California. A 26-mile section full of twists and turns with constant climbing will take the riders past the rugged beauty of the Frank Raines Regional Park, leading to a relentless climb over the backside of Mt. Hamilton. With an elevation of 4,360 feet, Mt. Hamilton will be one of the highest elevations ever reached in the Amgen Tour of California. After the descent, the riders will head to Sierra Road, another epic climb. Once the riders crest Sierra Road, the peloton will complete the course with a quick 18-mile run into the finish line in San Jose. (Start time: 10 a.m.) The remarkable views of Stage 4 have distinguished it as a race favorite for riders and spectators alike. Beginning in Seaside with a short neutral lap and traveling along a similar route to previous years, the peloton will head south on scenic Highway 1 where sweeping vistas of Big Sur and redwood forests flank the Pacific Ocean. At more than 130 miles and with three KOMs ("King of the Mountain" competitions), Stage 4, sponsored by Olevia, is the longest stage of the race and has proven to be a test for the riders with consistently hilly and technical terrain. The long day will take the riders down the California coastline by Hearst Castle before shifting inland toward the finish line at the intersection of Osos St. and Monterey St. in San Luis Obispo. (Start time: noon) The quaint Danish village of Solvang annually hosts some of the ProTour teams for training camps as well as some of the largest cycling events in the United States. At only 15 miles, slightly longer than the 2007 individual time trial and with the start and finish lines located only one block apart, Stage 5, sponsored by ADT Security Services, is an ideal location for spectators to view the race. The route will highlight some of the most beautiful areas of Central California, winding through quaint towns, vineyards, farms, and one short, but steep, climb. This year's short, flat and fast time trial will create a challenging test for the riders and is expected to be a decisive day of the race. (Start time: 11 a.m.) Stage 6 could be the pivotal stage for the 2008 Amgen Tour of California. The stage is one of the longest at 105 miles, and it is heavy on climbs with four KOMs, three sprints and a demanding finishing circuit in Santa Clarita. With the individual time trial late in the race again this year, there is the potential for several riders to be separated by just a few seconds as they begin the stage. After a start in view of the Santa Barbara shoreline, this stage, sponsored by Health Net, will take the peloton to Highway 192 and through the town of Carpinteria. The route will then take the riders on Highway 150 where they will face two KOMs before passing Lake Casitas and riding into the scenic town of Ojai. The third KOM will be just a few miles outside Ojai, and then the course will head downhill into Santa Paula. The ominous Balcom Canyon will be the final climb of the day, where in 2007 nearly 25,000 fans formed a narrow corridor for the riders. The cyclists will end the day with three circuit laps in Santa Clarita that finish at McBean Parkway at the Valencia Town Center. (Start time: TBD) By configuring the final stage of the 2008 Amgen Tour of California as a difficult point-to-point road race, there is a chance to see an overall lead change, as well as a change in the KOM jersey leader on the last day. The first 25 miles of Stage 7, sponsored by Amgen, include a gradual climb from Santa Clarita to the intersection of Angeles Forest Road. The route continues uphill to the highest elevation ever reached by the Amgen Tour of California on the towering Millcreek Summit (4,906 feet). Descending with an eight-mile run to Angeles Crest Highway, the route begins a fast plunge to the Rose Bowl in Pasadena. After more than 60 miles from Santa Clarita to Pasadena, with the mountains and the Rose Bowl serving as the backdrop, the peloton will complete the stage and the race, with six five-mile laps on a very demanding circuit around the Rose Bowl. Organizers expect a hard sprint to the finish; as with all the Grand Tours of Europe, winning the final stage of the 2008 Amgen Tour of California is a prize coveted by the riders. For complete downloadable course maps, please visit www.amgentourofcalifornia.com. Additional resources such as log sheets, elevation profiles and recommended viewing locations will be added to the Web site in the coming weeks.